Ben Stokes is congratulated by England captain Joe Root. Jos Buttler admitted feeling “an element of disbelief” as Sri Lanka spinner Lakshan Sandakan twice reprieved Ben Stokes by over-stepping, helping England move one step closer to a 3-0 whitewash in Colombo. A clean sweep away from home has only been achieved by two other England sides, in series of at least three Tests, but the class of 2018 need just six more wickets on day four to repeat a feat last achieved in 1963. At 53-4 a ground-record chase of 327 looks well beyond a home side who were at least partially to blame for their predicament. The key partnership of England’s second innings was an 89-run union between Buttler and Stokes from the rocky beginnings of 39-4, but the pair would have been parted much earlier had the all-rounder not been reprieved on 22 and 32. On both occasions he was on his way to the pavilion only to turn back when replays saw Sandakan called for no-balling. Analysis later indicated he had been clearing the front line as often as 40 per cent of the time without being censured. “Of course there’s an element of disbelief but it’s great when you get to carry on batting,” said Buttler, who advocated removing the line call from the on-field duties. “They check it every time there’s a wicket and you can see it’s close. It’s a really tough job for the standing umpires, there’s a lot going on when the ball is spinning. 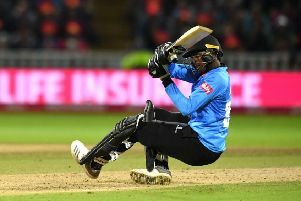 Sandakan’s errors did nothing to detract from the latest impressive contribution from Buttler, whose calmly-compiled 64 took the game away from Sri Lanka and extended his total to 760 runs in 18 innings since being recalled to the red-ball format. His Test comeback has been a great success to date and Buttler explained that is partially down to an ability to compartmentalise his explosive limited-overs methods. It’s been a really nice year, I’ve enjoyed playing Test cricket again. “It’s been a really nice year, I’ve enjoyed playing Test cricket again,” he said. “A lot of people in my career, for a number of years, have said ‘why don’t you bat like you do in one-day cricket?’ but I’ve never quite seen it like that. If it was possible then more people would have done it. “Someone like Adam Gilchrist...if you watch the highlights package it’s incredible but there’s other hard work that goes on around that. I don’t think it’s possible to play in that fashion all the time. England were afforded 17 overs to make inroads into Sri Lanka’s batting lineup and rammed home their advantage with zeal. Moeen Ali, on new-ball duty, accounted for both openers as Danushka Gunathilaka nicked a sharp off-break to slip and Dimuth Karunaratne exposed his off stump with a loose shot. Jack Leach had Dhananjaya De Silva lbw on a smart review and Stokes landed one more before stumps, goading Angelo Mathews into a brainless pull to midwicket. England began the day 99 ahead but quickly managed to turn a hard-won position of strength into a flimsy top-order procession. Keaton Jennings succumbed lbw to the first ball of the day, Dilruwan Perera coaxing a wicket-to-wicket delivery into the front pad, before picking off Rory Burns in identikit fashion. The duo have had moments of success in the first series of the post-Alastair Cook era but ended on a low here and will look forward to resuming their union away from the exaggerated spin of Sri Lanka. Perera’s probing saw him pick up first-innings centurion Jonny Bairstow next, with Kaushal Silva on hand to hold a firm chance at short-leg, and when Root fed a leading edge back to Malinda Pushpakumara just nine balls later England were wobbling before Buttler and Stokes arrived. Twenty-four hours earlier, Adil Rashid toasted his game-changing double act with Stokes. Rashid scooped career-best figures of 5-49 and claimed a rare run-out. Rashid said: “It was a simple plan for me: to be attacking, bowl my variations, try and get the ball spinning both ways, get the batsmen playing certain shots. Stokesy had his own plan, be aggressive, run in, rough them up.